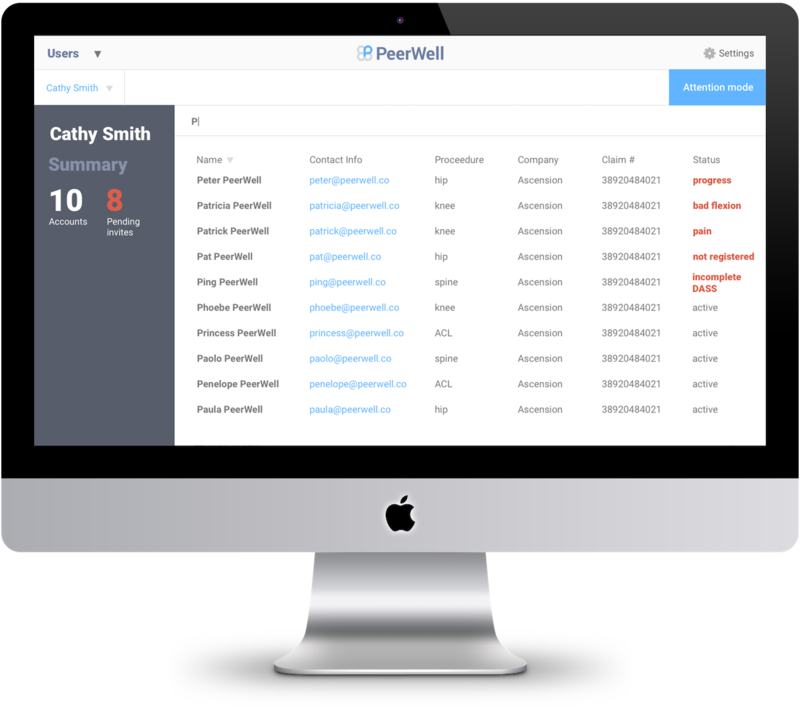 PeerWell Helps Professionals to Optimize Patients and Streamline Workflows. Take control of your population’s surgical outcomes. PeerWell empowers patients to actively improve their health and lower pre-op and post-op risk. Through PeerWell, patients become mentally, physically and environmentally prepared for surgery. Graduates of PeerWell’s PreHab and ReHab program have better outcomes, are lower risk, and cost less. PeerWell serve as an extension of providers, offering patients education and guidance well-beyond what they’re afforded in the physician’s office, over the phone, or in a hospital class. 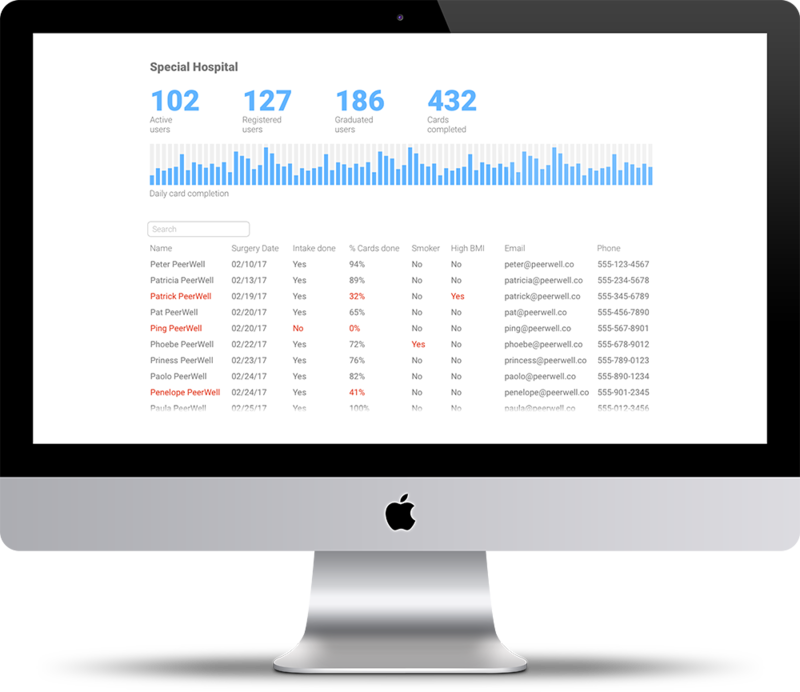 Case managers can keep better track of your population's surgery preparation, risk, and recovery in the PeerWell dashboard. Case managers will improve efficacy and can prioritize patients who need it most. PeerWell delivers a consistent and proven process for patients to prepare for and recovery from surgery. Standardized surgery prep and recovery helps your health system meet targets and track success. PeerWell reduces length of stay by 45% and improves discharge to home by 70%. With our PreHab and ReHab program, patients can outperform even the loftiest of ACO targets. Get consistent results while reducing staff workflow. PeerWell’s proven program ensures no patient is left behind, while raising the benchmark of care and outcomes. 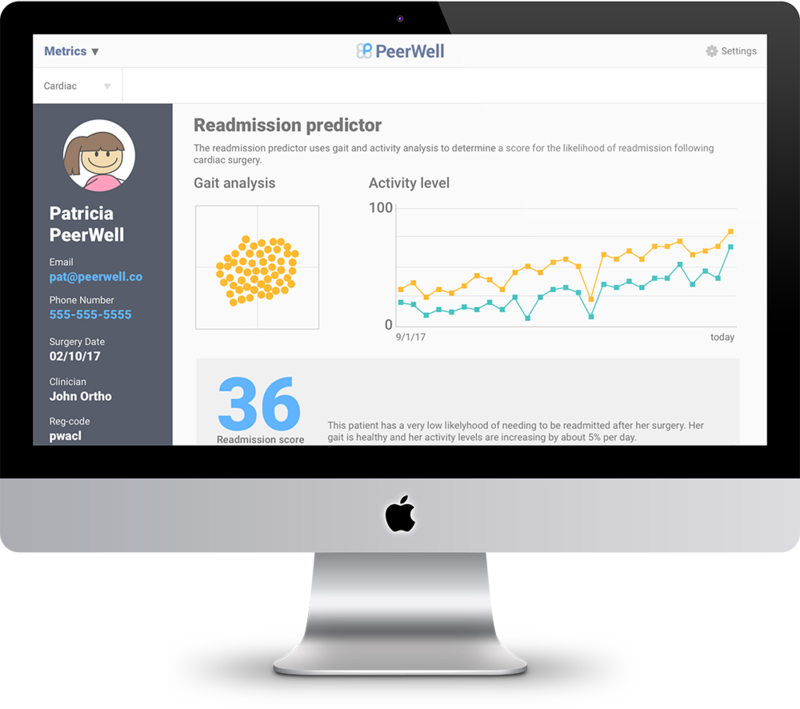 Identify and keep track of at-risk patients by checking in on their progress in the PeerWell dashboard. Greater visibility into real-time patient progress on a large scale is powerful. Let PeerWell serve as an extension of you, guiding patients to a lower-risk surgery and improved outcome. Get reliable results across all patient groups so that you can take on lucrative, at-risk contracts. With PeerWell, patients feel more supported. Reap the rewards of happier patients and greater patient satisfaction. PeerWell takes surgeons from a median discharge home rate of 61% to 92%. Become an outpatient surgery allstar with patients who are ready, willing, and able to go home. PeerWell contributes to the quality and reporting measures Medicare now requires under MACRA, MIPS and CJR. Increase compensation by collecting easy-to-analyze, reportable data. In just two minutes, patients are set-up with PeerWell’s pre-op and post-op program. PeerWell is a “set and forget” platform that lets you decide when to check-in. Let actual patient data and testing inform your BIG decisions. Gain invaluable insights while seeing your solutions work on real patients, in real life. Testing and data collection shouldn’t be limited to the clinic or lab. See how your solutions work in the real world as patients monitor activity levels, complete informative surveys, and get diagnostic test results from their phones. Discover unintended ways your solutions can help patients. Unprecedented data collection offers a unique opportunity to better serve patients and improve healthcare. At PeerWell, we're eager to use technology to better understand health and to deliver new and improved ways to treat conditions. Let’s work together to build custom solutions for your patients.